Scarr Head is a working farm with a small camping/caravan site. Three non-smoking static caravans are available for hire. Read more about Scarr Head. In the heart of the western Lake District with stunning views over farmland to the Eskdale fells are four fully furnished static farm caravans. 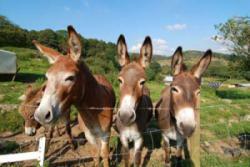 Park Gate Farm is a rural working farm with panoramic views, nearby pubs if you don't feel like cooking and donkeys to feed if you feel like a little company. 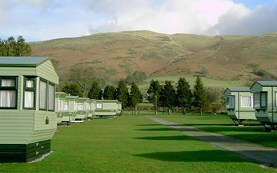 Read more about this unspoilt corner of the English Lake District and these static farm caravans. If you really want to get away from the crowds then head up to Lorton Vale. Two six-berth static caravans are available for hire on this secluded trout-fishing farm. Lorton Vale is a few miles west of Keswick very near Whinlatter Forest Osprey Watch. Read more about Lorton Vale Caravans. Offering a great combination of an idyllic setting in western Cumbria and within the grounds of an award winning pub serving locally sourced food and great ales, The Wheatsheaf Inn at Low Lorton has a small number of static caravans to let. A small site set in woodland with static caravans to rent. This site has won a David Bellamy Conservation award. Read more about these static caravans in west Cumbria. Ideal for exploring the northern Lake District, Brownrigg Hall is approximately 20 miles from Keswick. This peaceful site is on a working farm and has three well-equipped caravan for rental. Read more about Brownrigg Hall Static Caravans. Just two miles outside Kendal in the idyllic setting on a rural sheep farm there are two static caravans for hire at Patton Hall Farm. Three static caravans are available at Upfront Gallery and Puppet Theatre. Located near to Penrith the Gallery also has a vegetarian restaurant. Read more about the puppet theatre and caravans.